I have always loved to read, I can’t remember a time when I didn’t enjoy reading. As a child I loved visiting the library to choose my books, scanning the shelves for a book that caught my eye, handing over the green tickets to the librarian and rushing home eager to start reading my new books. My mum would often find me under my duvet with a touch reading my book when I should have been sleeping, desperate to see where the story was going to take me. This has continued into my adulthood and whilst I now buy my books, I still love finding new authors to read. I read every night and there have been many nights where I just couldn’t put the book down. Going on holiday before I had children was always an exciting time, I would plan what books I would take, making sure I had a good mixture and I would take at least five books with me. Normally finishing them all and reading Andy’s too. Now I’m a mummy it takes me a lot longer to finish a book, I am lucky if I read more than five minutes before I fall asleep. But, I am trying this year to go to bed earlier to enjoy reading for a bit longer before sleep takes over. When I became a mummy to Alice it was like a new world opened up to me, all the wonderful children’s book to choose and read to Alice. 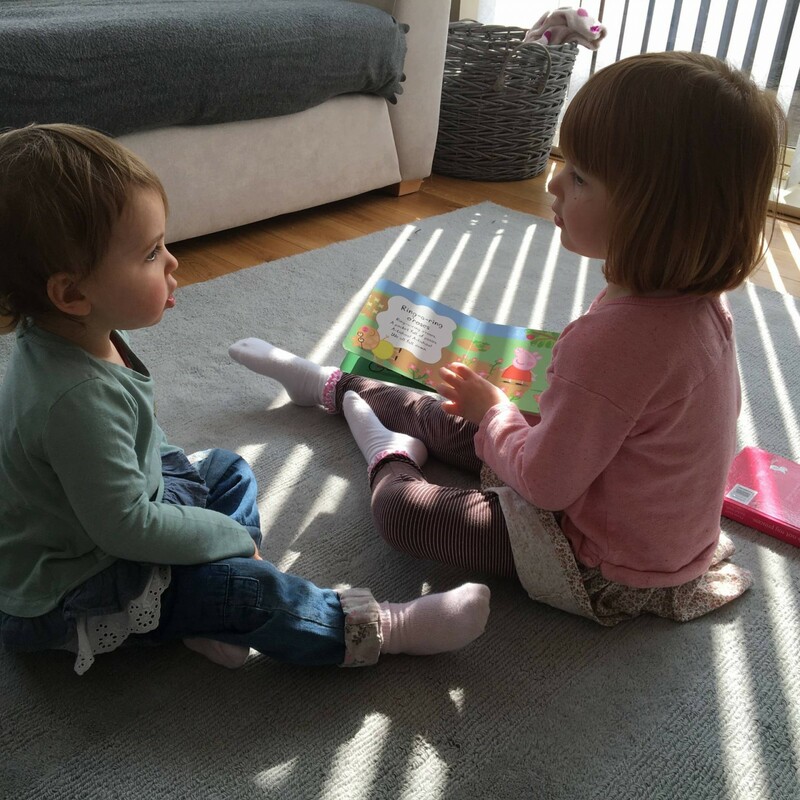 It very quickly became an everyday moment to sit and read a book together. 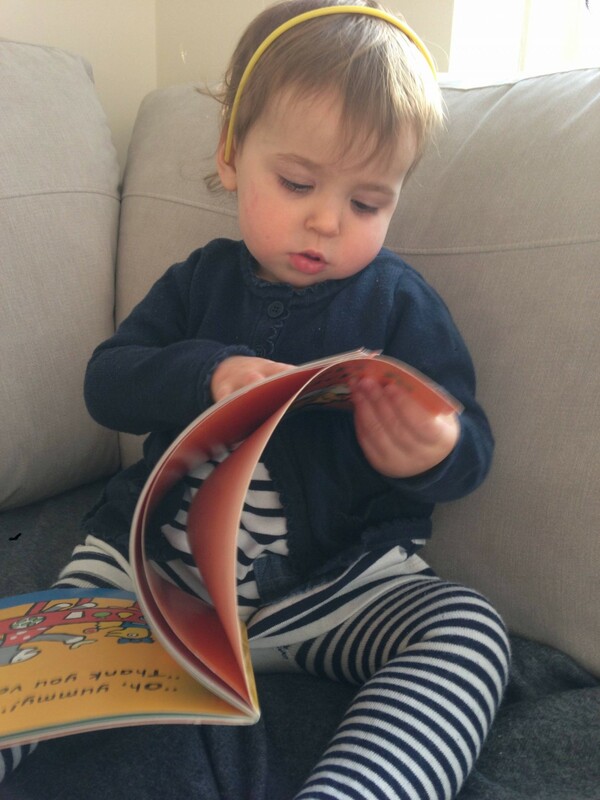 It starts with the touchy feely books, moves onto the books that you can turn flaps and then the time where you can read a book from start to finish without them turning the page before you have got to the end. 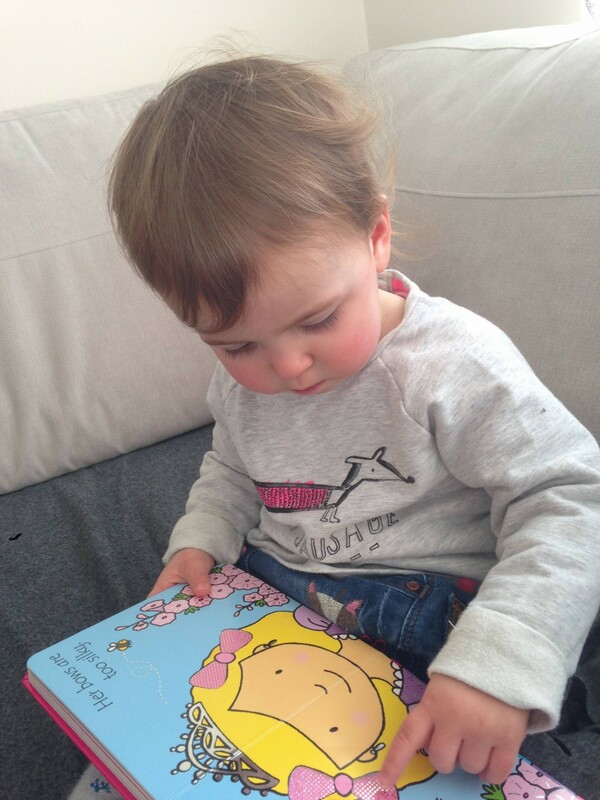 Alice loved books from a young age and still does. Whereas Holly was a lot slower in her love for books, but she is making up for it now. The last six months she has become a little book worm. Every day she will go to the book shelf and bring a book for me to read her. I can see her coming and she turns round to back up to me and sit on my lap, it’s so cute. I will often think Holly has gone quiet what is she up to and I will find her sat with a book. She now also likes to read to me, well she likes to jabber along, as any nineteen month old does. 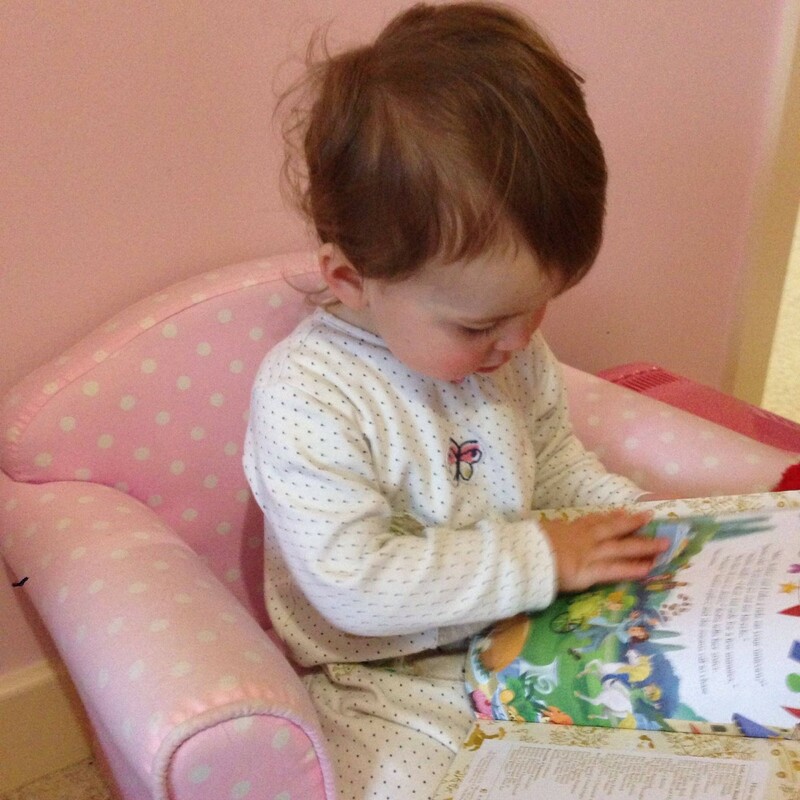 Alice loves to read to Holly too and they can often be seen sat together with Alice reading to Holly. I think Alice likes to play teacher, but it works and they both love it. Our bedtime routine ends with story time, this has changed as Holly has got older, but now we have a routine that we will be doing for a long time. Both girls choose a book and we read two stories together. Sometimes Alice likes to read her story to us, which means that Holly and I can snuggle on Alice’s bed together. But most of the time it’s me reading to them. 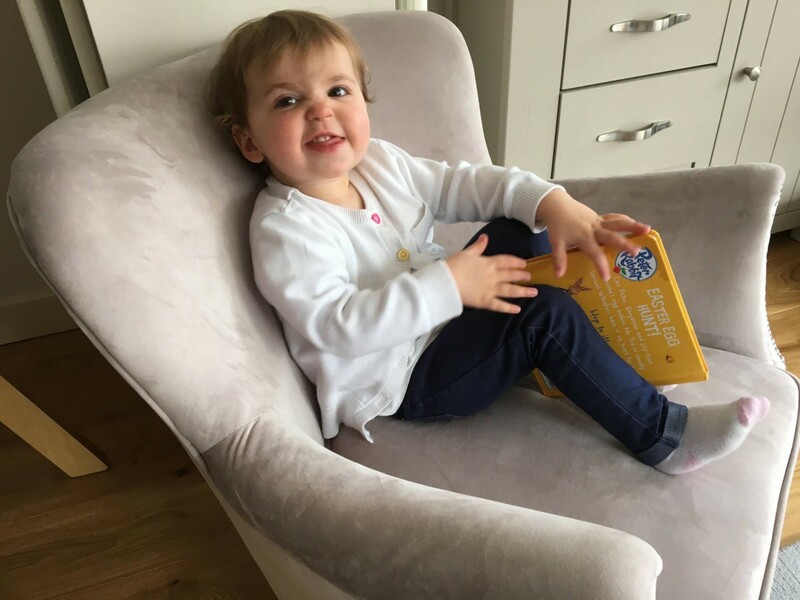 I know that every child loves book to some extent, but with Holly, she just seems to love them that little bit more. She is a mini me in so many ways already and I hope that being a book worm is one too. Neither of mine are hugely into books but I hope that changes in the future as like you I loved to read & still do when I can find the time! I was a book worm when I was younger too but never find the time to read now sadly. But I do absolutely adore children’s books! The girls have a very impressive bookshelf and I can’t stop buying them! Luckily they do seem to like their books but perhaps not with the same enthusiasm that I do! I love reading too but it is so hard to find the time to do it as a mum. But I also love reading with the kids and there are so many wonderful children’s books out there. It’s also one of my favourite things to do when I’m working in the nursery! Story time is the best time of the day. Aw its lovely. We all love books in this house too. I don’t often find enough time to read as much as I’d like to anymore though. The children all love books, and Harry in the last year has discovered bigger books such as Roald Dahl and more recently the David Walliams books. I’m odd in that I have a continuous rotation of books re-read over and over again in between reading new ones. All easy reading, I love the comfort and familiarity of reading books again and again.